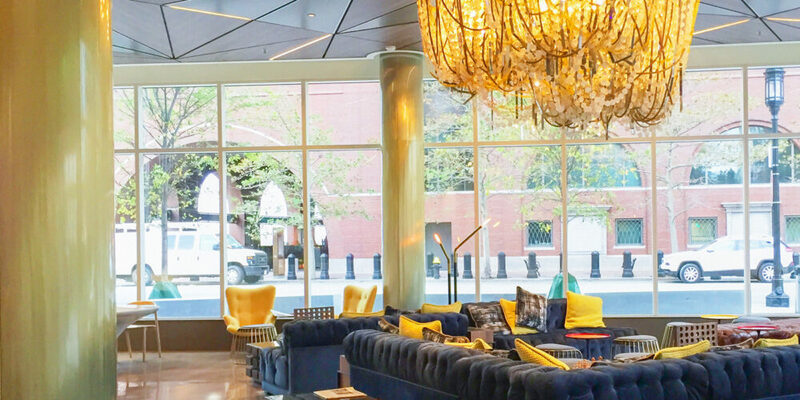 As a pioneer in the newly emerging Seaport Innovation District, the 136-room, Four Diamond rated Envoy Hotel is one of the top boutique hotels in the Boston area. The lobby’s bold interiors and easy styling contrast with the city’s New England traditions – an aesthetic fit for this wunderkind neighborhood. The lobby of the Envoy Hotel showcases a quintessentially urban view, providing tastes of comfort with custom details, hints of surprises, and pops of color. The unique yellow column covers radiating soft yellow gradients were selected from Móz’s signature Gradients collection. The sunny metallic tones begin as a bright yellow color then gradually fade to a transparent layer, revealing the raw aluminum material underneath. Round Columns are a standard product by Móz that offered an easy-to-assemble solution that covered essential structural elements at the Envoy Hotel. The metallic yellow surface, customized with a striated grain and glossy finish, bounces light across the room to create a sunny atmosphere. Led by the spatial geographic model of California’s Silicon Valley, innovation districts are a recent trend in urban development, with zones now being dedicated exclusively for the purpose of clustering entrepreneurs, start-ups, business accelerators, and tech incubators. These new areas are easily accessible, rich with amenities, and nurture collaboration and knowledge-sharing. 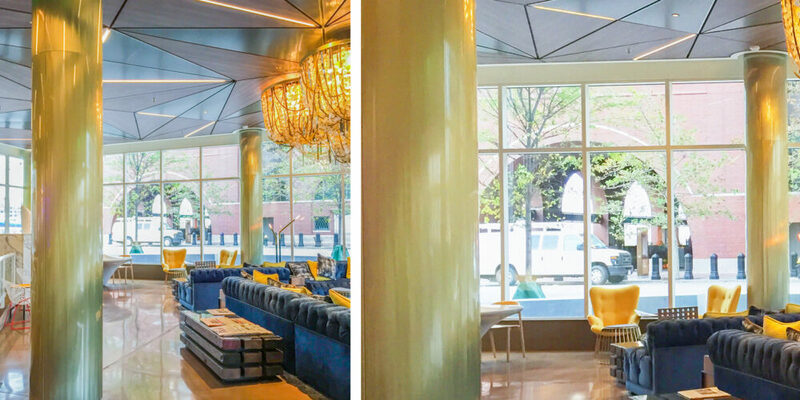 Situated within the first official innovation district on the East Coast, the lobby design for the Envoy Hotel aimed to reflect these technological aspirations, with the radiant Móz columns serving as beacons for this new frontier.